Recovery Colleges are a rapidly expanding innovative approach aimed at supporting the personal recovery of people with mental health issues. A/Prof Brophy is a member of the Recovery College’s International Community of Practice that includes members from the UK, USA, Uganda, Ireland, France and Italy. However there continues to be a need for more high quality evidence that supports the further development of this innovative service model. The aim of our evaluation was to systematically examine the processes involved in the implementation of the college and to measure intermediate outcomes for people who engaged with it. We employed a co-produced mixed-methods design, involving people engaged with metropolitan and regional Victorian College campuses. Fifty-one people participated in the evaluation, including: previous and current students with a lived experience of mental ill-health; families and carers; staff members; and community stakeholders. We found that students reported a high level of satisfaction with the Mind Recovery College™ and positive impacts on various aspects of their lives, including the promotion of learning and growth, the adoption and maintenance of a healthy lifestyle, employment and cultural activities. 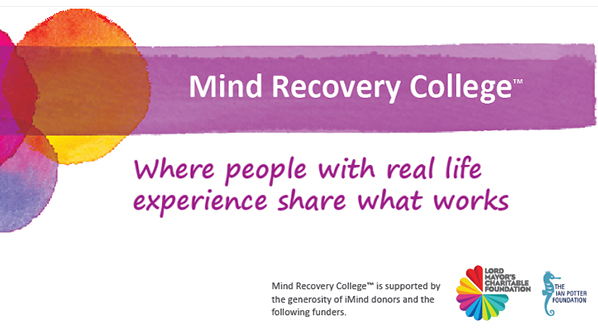 We found that through its emphasis on personal strength and education, the Mind Recovery College™ appears to be assisting people with mental ill health to feel more empowered and able to address their personal recovery.